The cumulative mass balance loss from 1980 to 2016 is -19.9 meters, the equivalent of cutting a 22-meter-thick (72-foot-thick) slice off the top of the average glacier. Explore this interactive graph: Click and drag either axis to view different parts of the graph. To squeeze or stretch the graph in either direction, hold your Shift key down, then click and drag. The graph shows cumulative mass loss in "meters of water equivalent," which is the depth of the meltwater spread out over the glacier's surface area. Data* are from the World Glacier Monitoring Service, and provided by Mauri Pelto. Glaciers that exist today are remnants of the last ice age. Thick sheets of ice advanced and retreated across most continents several times before withdrawing to the polar regions about 10,000 years ago; continental ice sheets still cover Greenland and Antarctica. Originally, scientists began studying glaciers only for the clues they offered about Earth’s climate during past ice ages. Today, they are also trying to understand how quickly human-caused climate change will cause them to disappear altogether. Glaciers gain mass through snowfall and lose mass through melting and sublimation (when water evaporates directly from solid ice). 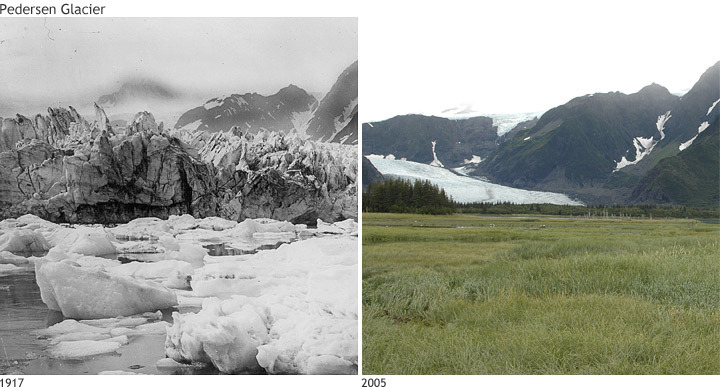 Glaciers that terminate in a lake or the ocean also lose mass through iceberg calving. To see if a glacier is growing or shrinking, glaciologists check the condition of snow and ice at several locations on the glacier at the end of the melt season. The scientists check snow levels against stakes they’ve inserted in the glacier, dig snow pits in the surface to examine the sequence of seasonal layers, and insert long poles into the glacier to probe characteristics of the snow and ice. 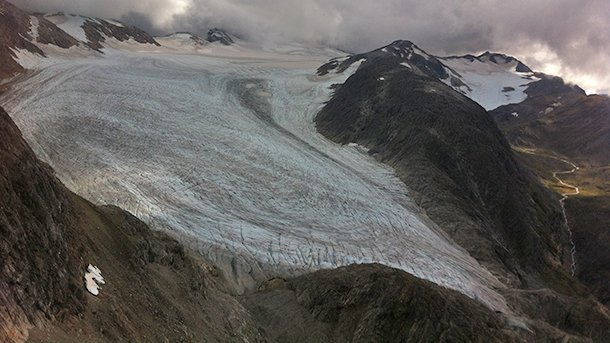 Alaska’s Lemon Creek Glacier in September 2014. Virtually no snow covered the glacier, which exposes the terminus to the Sun and accelerates glacier retreat. This glacier must keep at least 62% of its snow cover to keep from losing mass. Photo by Chris McNeil, via Mauri Pelto. Generally, the difference in thickness of snow from the previous measurement indicates the glacier’s mass balance—whether the glacier has grown or shrunk. Scientists have described more than one hundred thousand glaciers in the World Glacier Inventory, but only a small fraction of these have been consistently monitored for long enough to measure climate-related changes in their size or mass. Scientists refer to this collection of about 40 glaciers as "reference" glaciers. 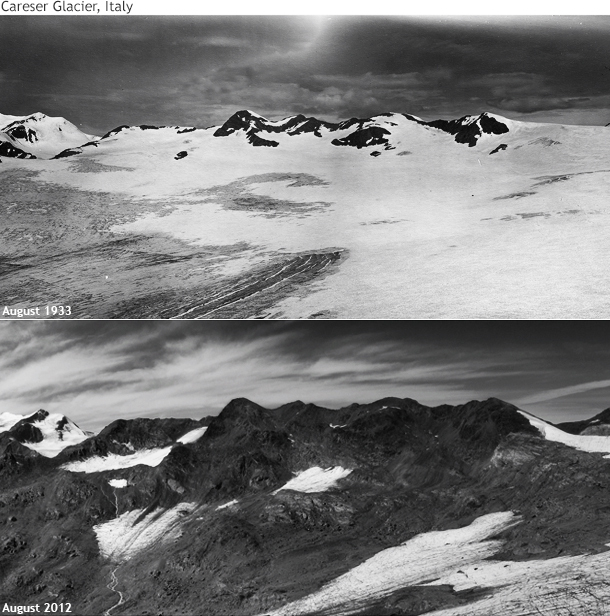 Photos documenting the disintegration of Italy’s Careser Glacier between 1933 (top) and 2012 (bottom). Careser is one of ~40 climate reference glaciers in the World Glacier Monitoring Service's inventory. Photos courtesy of Luca Carturan, University of Padova. In the 2017 State of the Climate report (edited by NOAA NCEI scientists and published by the American Meteorological Society), scientists reported that in 2016 (the most recent year with complete data), reference glaciers lost the equivalent of 847 millimeters (33 inches) of water, meaning the equivalent depth of water (spread out over the entire glacier area) that would be produced from the amount of melted snow or ice. Of the 29 reference glaciers that had been surveyed in 2017*, all but three showed a negative mass balance, for an overall negative balance of 1,036 millimeters (41 inches). Glacier mass balance (gray bars) from 1980–2017 for 37 worldwide glaciers with at least a 30-year monitoring history. Observations for 2017 are preliminary. Cumulative mass losses (orange line) have accelerated since 2000. As of 2016, the total loss was -19.9 meters, the equivalent of cutting a 22-meter- (72-foot-) thick slice off the top of the average glacier. NOAA Climate.gov graph adapted from State of the Climate in 2017. Today, many glaciologists are more concerned with predicting when various glaciers will disappear. In many parts of the world—including the western United States, South America, China, and India—glaciers are frozen reservoirs that provide a reliable water supply each summer to hundreds of millions of people and the natural ecosystems on which they depend. *Data from the most recent year are preliminary and may not include observations from all reference glaciers. Pelto, M., WGMS Network. (2018). Alpine glaciers [in State of the Climate in 2017]. Bulletin of the American Meteorological Society, 99(8), S23–S25. Zemp, M., Roer, I., Kääb, A., Hoelzle, M., Paul, F., and Haeberli, W. 2008. Global Glacier Changes: facts and figures. World Glacier Monitoring Service, UNEP, 88 p. ISBN:978-92-807-2898-9. Accessed August 29, 2011. World Glacier Monitoring Service Glacier Mass Balance Bulletin Accessed August 29, 2011. 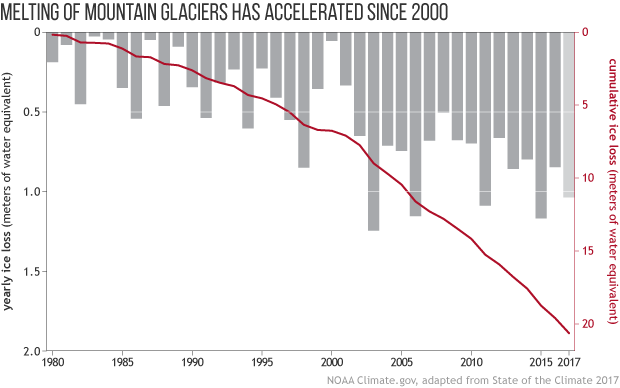 Worldwide, most glaciers are shrinking or disappearing altogether. Melting glaciers and ice sheets are the biggest cause of sea level rise in recent decades. Glacier loss is a serious threat to ecological and human water supplies in many parts of the world.